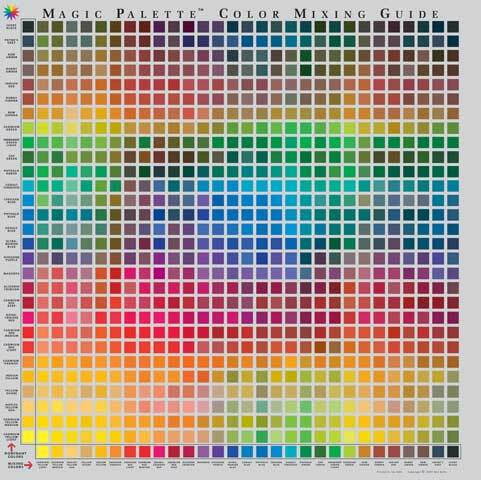 Magic Palette Color Mixing Guides Color Wheel Co.
Mixing the right color just got easier! The Magic Palette Mixing Guides take the guesswork out of mixing beautiful, luminous colors. Each guide features a comprehensive easy-to-read grid that shows the resulting color when 2 colors are combined. An indispensable tool for artists and designers of every experience level, they are ideal for studios, the classroom and plein air painting. The 11-1/2" x 11-1/2" Personal Mixing Guide presents 324 colors created from 18 paint colors that are essential to most artists. The guides are printed in high quality for color accuracy and include detailed instructions.